Nowhere, anywhere has there been such a large discount on Banks Power Products . . . and that's exactly what we're offering you for Cyber Monday, 2014. Enjoy 11% OFF Banks products, for (1) day only, December 1st, 2014. Simply use coupon code: BFBANKS and get 11% off your entire order or $100 or more. Take advantage of this once in a lifetime sale at http://www.bankspowerproducts.com or click here --> to go to BanksPowerProducts.com now! It's no wonder that I need to write a blog on torque converters for the Ford Powerstroke. While many people would think of the 6.0L Powerstroke when considering components that break down regularly, the Powerstroke torque converter has had problems for a while now. A torque converter has a rather simple function - driven by flowing fluid and by clutch discs, the torque converter is the critical connection between your axle and your transmission. Without the torque converter, your vehicle would jerk and lurch back and forth on each shift. Not only would that potentially give you whiplash, it would do something similar to your drivetrain. So to lessen the jumpiness of shifting between gears, your torque converter drives your axle with a large turbine that is driven by fluid pressure, and also locks itself together when maintaining speed by applying sufficient pressure to the clutch discs. Due to consumer demand, diesel pick-ups started coming with lessened hydraulic pressure for your clutch discs. What this effectively does is provide a smoother shift, but it does so by allowing your clutch discs to slip excessively. Combined with this extra wear and tear, Powerstroke torque converters eventually fail on their own even when you've made no modifications to your pick-up. They're designed to perform within stock powerband specs, but there-in lies the problem - the amount of force that your clutch takes is directly proportional to your pick-up's payload. So if you're running stock and towing, or even if you're travelling uphill with a filled cab, you're now putting too much force on your torque converter. The way that Ford made their torque converters with such a low power threshold is mostly due to the poor quality materials they used and the poor assembly methods they employ. A stock Ford torque converter has sandpaper clutch discs. PAPER! And the case, it's got welded mounting brackets instead of using a solid piece of steel and boring out those mounts with a diamond tipped drill. And their turbine! the fins hold onto the turbine by being crimped on. That's just a bad joke, because once your torque converter gives way, it immediately starts contaminating your transmission fluid and immediately starts damaging your transmission, with all the fluid contaminants falling straight onto your planetary gears. It's no wonder that people think American manufactures like Ford are just making their money from replacing flawed parts. It's because they are making their money that way. 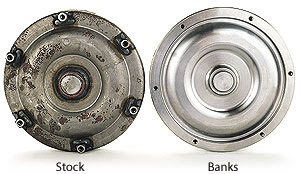 Long story short, the Banks Billet Torque Converter will take care of all your existing manufacturer defects. Their casing is made from solid steel, their turbine fins are fastened in place and heat-treated to strengthen the bond, and their clutch discs are made of a ceramic-composite material that won't fail when you're pushing power gains. As a side note, you can further protect the longevity of your transmission by installing a Banks Transcommand module. The module's only function is to regulate the hydraulic pressure for your clutch, so that an increase in throttle will also automatically engage an increase in hydraulic pressure. Essentially, this module gives you the best of both worlds by providing still smooth shifting at low RPMs and stiffer shifting at higher RPMs. With stiffer shifting, you get less slippage, and likewise, less clutch wear and less friction heat in your transmission fluid. An added incentive to having both the Banks Billet Torque Converter and a Transcommand Module is that your pick-up will have a much quicker response right off the line. You'll be able to slam your throttle without excessive clutch slippage, so your power will be quickly and thoroughly translated to the road instead of being translated into excessive heat. This is just one way that Banks gives you more power right off the line without compromising your vehicle's longevity whatsoever - as a matter of fact, you get more power while prolonging your vehicle's life! Sounds almost too good to be true (but not really, we already know the Powerstroke has room for improvement). Trust Banks Power Products to help you get your diesel running properly and effectively. Gale Banks has been doing this for over 50 years. What else can I say? Respect. The Banks Power Products iQ Display is a PDA, plain and simple. With previous Banks tuners, the PDA display was basically one of those annoying palm pilots that had the horrible touchpad for writing recognition, which never worked well. But the iQ display is just as dialed in as previous model Banks displays, while incorporating new touchscreen technology for their wide-size display. So what's so special about it? The iQ's hardware isn't state of the art - touchscreens have worked well for a while now. What IS special about the iQ is the work that went into it, just like the previous PDA display. It will accomplish everything you need and more. With the Banks iQ and flash unit, Banks has begun to transition all of their tuners and modules into one simple hardware package. Whether you get an Automind or a Speedbrake, the Banks iQ syncs to your Banks components for completely fluid functionality. And with the new flash unit, it will only be a matter of time before you're only paying for software - order your Speedbrake, tuner, transmission module, and they'll eventually come on the same flash module. That takes care of a lot of hassle with installation and cost-efficiency. But wait, is there more? Like mentioned in earlier blogs, Banks has been working on their "brick" for a while now. Their brick connector is the second half of their flash module system. With the brick, you'll be able to sync your secondary injection systems, measurement probes, and all your other major electronically controlled systems to your iQ display. This opens up lots of possibilities - have all the electronics on your clean-burning diesel controlled by one system, providing optimized tuning and fuel economy. or, turn your street legal diesel into a race-ready diesel with the push of a button (your CAT and DPF will still be there, but at least you're only losing 10% power). Banks makes state-of-the-art products not because they get hands out from parties like NASA. They make state-of-the-art products based upon civilian technology (which isn't state of the art), and they achieve state-of-the-art status by improving upon existing designs until they have the nearest to perfect design in comparison to anybody else. With Banks, you get what you pay for, and you pay for what you get. Other companies may charge less, or may offer similar pricing claiming to be better than Banks Power Products. But the truth is that the number of aftermarket companies that can keep pace with Banks can probably be counted on your fingers. And for the most part, the companies that are on par with Banks don't manufacture the same components as them. If you have doubts, give Banks a call. Their customer service reps are always excited to shoo away their competition. Banks Power Products have incorporated the term "Ram" to all their intake systems and intake components. When describing intakes, the term ram-air refers to a specific intake design where positive air pressure is created at the intake by directing airflow towards the intake while your vehicle is traveling at speed, effectively "ramming" cool air towards your engine. Ram-air intake systems were quite popular before the inception of the carburetor, and were unpopular during that time because the positive air pressure didn't work well with the low-pressure venturi fuel draw method that carburetors relied upon. But now, with the inception of fuel injection, ram-air intakes have been making a very strong come-back. Pretty much all performance diesel engines run off fuel injection these days, because carburetors just can't get the pressure that injectors can, and likewise can't burn fuel as efficiently. Banks has been on the fore-front of developing performance diesel engines, so it's little wonder why they've incorporated the Ram-Air concept to all of their intake systems, since all diesels have been running on fuel injection for several decades. So how do Banks Ram-Air systems stand up to their competition? With ram-air intakes, you want positive air pressure at the head of your intake system, but you don't want the air flowing to your engine to be travelling at such high velocity that it swishes about your intake and into your engine. The difference is that still air that has the same pressure as fast-moving air will always combust better than the moving air. So, Banks designs their intake systems to maintain a constant positive pressure from incoming air without allowing it to travel about. Their intelligently designed intake housings not only help accomplish this positive pressure effect, they also draw air from the most ideal location for drawing the coolest air from your engine bay, and you can also modify your intake housing to include a boost tube that streams cool air from below your bumper straight to the mouth of your Banks intake. For specific diesel models, Banks also offers their High-Ram and Monster Ram intake elbows. These elbows focus on the restrictive 180degree turn that your inbound air must travel through before arriving at your intake manifold. By streamlining the original design into a single rounded piece, and also by adding Banks' boost tubes that come with their elbows, intake drag is dramatically reduced. With all this cool air you're getting to your engine, you're on your way to a much cleaner burning diesel pick-up (make sure you have an exhaust system too!). 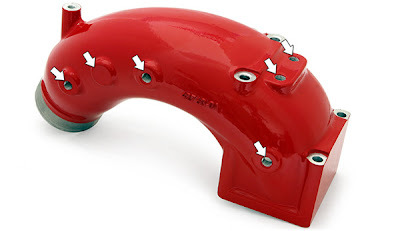 The cherry on top for these intake products is your Monster Ram or High-Ram intake elbow comes standard with 6 ports for nitrous/water/propane injection or for installing probes for active monitoring. Why is this so awesome? For one, monitoring your temperature and pressure is important for maintaining your vehicle's longevity. As far as fluid injection is concerned, you get significantly improved power (depending on which liquid you use), and improved fuel economy as well. If you're using water injection, how can you go wrong?? And why haven't automotive manufacturers incorporated this yet? Imagine filling up your water tank and diesel tank at the same time and getting 40mpg on your 7.3L Powerstroke, all because your engine is properly tuned and gets the ideal amount of oxygen. If you have a question about performance diesels, Banks has the answer or knows who can give you the answer. Don't delay, upgrade your diesel today! with Banks Power Products. For performance diesel trucks, having a reliable braking system is key. If you're racing professionally, you've got aftermarket everything to help you with this - performance brakes, rotors, transmission, clutch or torque converter, etc. Your stock diesel pick-up won't come standard with quality parts like these. This becomes an important issue for drivers using their pick-up for towing, racing, or just traveling long-distance with a large payload (like with a motorhome, RV, Semi, etc). So what are your options to increase your braking power without having to purchase more expensive discs or replace your stock brake discs more frequently? Your best option is exhaust braking, and Banks Power Products have several different methods for you to go about it. First, let's consider your payload. If you're pulling large enough loads to require a transmission modification or replacement, you're most likely better off with an exhaust brake that installs behind your turbo. Banks has standardized the ideal design for these exhaust brakes, complete with a module for transmission lock-up control and automatic downshifting. But for those that don't drive motorhomes or tow a significant payload, you may not want to bother with the maintenance that comes with installing a shutter exhaust brake. If you're just wanting to prolong the periods between changing out your brake discs, or if you need extra braking power that can't be accomplished with disc brakes, Banks offers their Speed Brake for a maintenance-free install at a modest price. A Banks Speed Brake comes with the same electronic functions as their shutter exhaust brake, which automatically downshifts your transmission when you've let your foot off the throttle and automatically locks-up your transmission. You can also set speed ranges for when your Speed Brake will activate, so you can maintain smoother driving at low speeds. So you might be wondering what's so special about this braking system besides managing your transmission for ideal gearing. The true braking power for this system lies within your existing VGT (Variable Geometry Turbo). VGTs automatically contract your exhaust pipe diameter at the turbo mouth so that your exhaust airflow will be more focused on the turbine at low speeds, and will expand in the same fashion when your turbo has already achieved desired boost. It does this with adjustable vanes at the mouth of your turbo, so that when an electrical signal is sent to your turbo, it will adjust according to the strength of the signal. The Banks Speed Brake uses this as an advantage for braking, because a constricted exhaust pipe will cause exhaust back-pressure (like a shutter brake does) by inhibiting the flow-through of the exhaust gases. This considerable back-pressure will resist your piston's ability to continue on with combustion cycles, and will work more and more effectively the higher your RPMs. So, the automatic VGT management combined with automatic transmission management have created a rock-steady product that Banks can stand behind. Consider this - A Banks shutter exhaust brake is more effective than their own Speed Brake, and is more effective than any other competitor's product. But even more remarkably, their Speed Brake by itself is more effective than a lot of their competitors' shutter exhaust brakes. Isn't that something? You're spending less money with Banks this time, spending less time under the hood, and you're getting a much more powerful, reliable, and sustainable product. Now that's smart engineering! If you have any doubts about the Banks Power Products difference, contact Banks directly and let them demonstrate for you how they take their competition to school. The Banks Six Gun Diesel Tuner is essentially the most powerful, standardized tuner that Banks Power Products offers. You can order a Big Hoss Module with customizable programs, and get +150hp and +300ft-lbs, but the Big Hoss Module is only offered for specific older model diesels. For the Six Gun, your highest power gains setting is at +100hp and +200ft-lbs. The Six Gun is normally offered with only their Six Gun Kits and Big Hoss Bundles. While their Stinger and PowerPack Kits offer substantial gains, these kits will only include either an Ottomind or Economind tuner, which are both more suitable for towing and fuel economy applications. The Six Gun Tuner is programmed with higher power gains, more suitable for race and off-road applications, and you'll need to install one of Banks' larger kits to get those power gains and to retain your engine's longevity. With your Six Gun or Big Hoss kit installed, you can set your Six Gun Tuner for maximum power gains without having to worry about voiding the warranty on your aftermarket parts or your stock parts. Banks kits, when properly installed and when using proper tuning, will not strain your stock drive-train components enough to risk substantial damage. But, because the Six Gun Tuner is the most powerful standard tuner that Banks makes, they had to find a happy medium to compete with other aftermarket manufacturers that offer more powerful programming than theirs. If you ask Banks yourself, they'll tell you that any further power gains beyond the Six-Gun's maximum setting is really not good for your vehicle. And yet, because people asked so frequently for more powerful programming on their street diesel, they started offering more powerful programming with a catch. All Six-Gun Tuners that do not include an iQ display come with a Speedloader module with thermocouple sensor, and all Six-Gun Tuners that include the iQ display have the Speedloader software pre-loaded on their iQ. The Speedloader programming offers an extra power gain of 20% on top of your current power specs. This means if you're pushing 300hp and 700ft-lbs with your Big Hoss kit installed, running on max power programming, the Speedloader software will bump you up to around 360hp and 840ft-lbs. The catch is that Banks doesn't stand behind this programming for street applications, and it's the only time that you'll see this from them. In order to activate your Speedloader programming, you must first clearly accept a disclaimer that says Banks and the garage that performed your installation are not responsible for any damage that can occur while running the Speedloader. Reason being, you're pushing so much power, that while your engine may not sustain significant damage directly, you may escalate your vehicle temperatures beyond acceptable thresholds, you may put some of your stock drive-train components under too much torsional force, and so on. If you're not understanding why you should be careful of running a Speedloader on your diesel truck, consider this: all other performance vehicles that push 400hp or more, including light-weight performance vehicles, all need performance drivetrain components to sustain their power without breaking themselves. Think about it - if you're putting nearly 1000ft-lbs of torque on your stock drive-train components, won't the give way fairly quick? Imagine your stock input shaft straining to translate all that power to your transmission. So all-in-all, Banks Power Products have what you need for your diesel, what you want for your diesel, and also (in this case) what you don't need but think you want. Call them today to so they can read your mind and recommend a local parts distributor near you. Banks Engineering has been beefing up your diesel for decades, and with all the new technology that has come out for vehicle motors, Banks Power Products have been on the forefront for efficient solutions and state-of-the-art innovations. One factor for diesel engines that greatly differs from gas engines is you need a more efficient means of combusting fuel. Diesel takes more air, more time, and more energy to combust in comparison to gas, but it also contains much more latent energy than gas. The key to turning diesel engines from oil-spilling, smoke-belching big blocks into smaller, clean-burning, high-performance engines lies in fine-tuning the efficiency at which your diesel engine burns your fuel. I've heard the comment before "diesel intakes and exhausts get a lot more power than gas intakes and exhausts". This is absolutely true because any diesel engine leaves a lot more improvement than any gas engine in regards to airflow. With our current fuel injection technology, and the possibility of water/propane injection, you can be getting up to of 30mpg on a newish model diesel pick-up, or 60mpg on your turbo diesel car. You may be asking "how is this possible?" Fact is that every time you saw an older model diesel engine spewing out black smoke from their exhaust, that black smoke is actually wasted fuel, so you can imagine how inefficiently diesel engines run in comparison to new technology. Banks Engineering has made a killing on factory deficiencies that can be easily remedied with quality-produced parts. Their Monster-Ram Intake is no exception. With one their intake and exhaust systems already installed, all you need do is include one of these badboys with a boost tube kit, and you've replaced nearly all of your stock airflow components. With the appropriate Banks Tuner, you're already pushing over +100hp and +250ft-lbs. Plus, with the Monster-Ram or High-Ram intake, you can incorporate injection systems and monitor systems directly onto your intake elbow. Why water or propane injection? Because with one of those systems properly installed, there's no need for an EGR or Catalytic Converter. With water or propane, you can combust your diesel fuel more completely, and likewise get a lot more power out of your engine while polluting less than gas! Yes, diesel can be cleaner than gas if you're completely igniting it, especially since it provides a lot more power, which translates to a lot better fuel economy. Imagine having to fill your diesel and water up at every refueling, so that you can get the fuel economy of a hybrid with more power than a stock diesel. Why aren't more people doing this already? Why hasn't any major manufacturer capitalized on the profitability of high-performance diesel yet? Maybe in the future. Banks Power Products - bringing you the best of diesel.